Notes: The original station at Quainton Road was opened in 1868 as an intermediate station on the Aylesbury and Buckingham Railway's (A&BR) single-track line to Aylesbury from Claydon Junction on the London and North Western Railway's Oxford - Cambridge cross-country route. The A&BR's line was worked from the outset by the Great Western Railway who turned down the chance to acquire the A&BR in 1874. The impoverished railway company was eventually absorbed by the Metropolitan Railway in 1891, who doubled the track in 1897. Quainton Road had become the terminus of the Brill Tramway in 1871, one of the first 'light railways' opened under new legislation brought in to support local lines. On 1 December 1899 the tramway became known as the Oxford and Aylesbury Tramway and was absorbed into the Metropolitan which initially planned to extend it to Oxford. 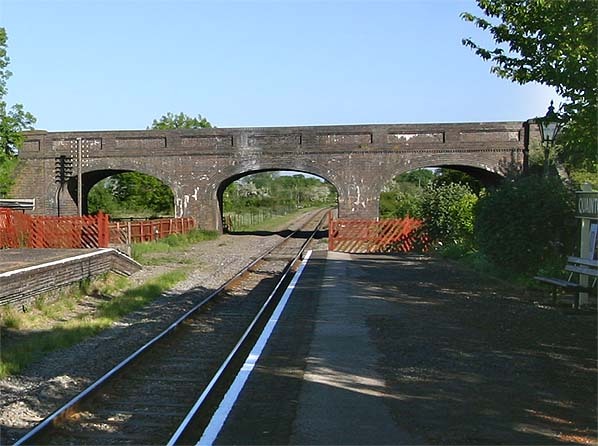 As a result of the replacement of the original level crossing by a road bridge, the original Quainton Road station closed on 29 November 1896 along with the Brill Tramway station, and a new combined station re-located to the east side of Station Road was opened by the Metropolitan Railway the next day. Too see other stations on the Great Central Railway between Sheffield Victoria and Aylesbury click on the station name: Aylesbury, Waddesdon, Quainton Road (2nd site)**, Calvert, Finmere, Brackley Central, Helmdon, Culworth, Woodford Halse, Charwelton, Braunston & Willoughby, Rugby Central, Lutterworth, Ashby Magna, Whetstone, Leicester Central, Leicester North***, Belgrave & Birstall, Rothley**, Swithland****, Quorn & Woodhouse**, Loughborough Central**, East Leake, Rushcliffe Halt**, Ruddington, Ruddington Factory Halt, Arkwright Street, Nottingham Victoria, Carrington, New Basford, Bulwell Common, Bulwell Hall Halt, Hucknall Central, Annesley South Junction Halt, Hollinwell & Annesley, Kirkby Bentinck, Tibshelf Town, Pilsley, Heath, Staveley Central, Renishaw Central, Killamarsh Central, Beighton (1st site), Beighton (2nd site), Woodhouse Junction, Woodhouse*, Darnall*, Sheffield Victoria & Sheffield Bridgehouses. The original station was west of the level crossing in Station Road as seen on this 1885 OS map.